Just started reading your blog, and I love it! I love the destop wallpapers and the free prints and everything! This recipe looks amazing, by the way. Hey, nice to meet ya, Jenna! This is genius! I actually tried making avocado milkshakes last year, also delicious! They didn't have lemon in them though, so I'll definitely have to give this a try. have you tried an avocado shake? These are devine. I have friends who can't get past the idea of avocado's and ice cream together. Such a wonderful thing. What do I put in the shake? I need to try one. I have one avocado left... Google, here I come. Milk, vanilla ice cream, ripe avocado, and sugar (1/4 cup) mostly to taste. lemon would be good never tried it. I made avocado ice cream some years ago (didn't try again, lol) and it was great! basically the same ingredients you used for your pie! (minus lemon juice) so thank you for posting this recipe and I'd love to know if you try the milkshake! I'm definitely going to try that shake. Thanks, supercalla! I spent four years of my childhood in Brazil, where avocados are eaten as a sweet fruit rather than in savory dishes. I actually still have a bit of a hard time stomaching *savory* avocado recipes, so this is right up my alley! Thanks! No brown; the lemon juice keeps it green. 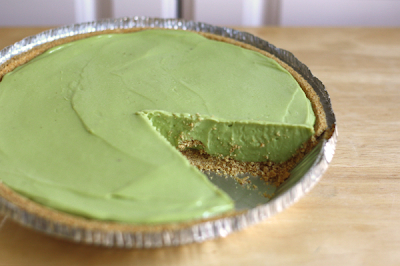 Okay, I just have to say, I'm TOTALLY weirded out by your avacado pie, and I LOVE me some avacado. So weirded out was I, that it took me passing this blog post in my reader three times before I got to the "tastes predominately like lemon part" which frankly has renewed me love for you and your blog. It was touch and go there for a little bit. Just being honest. I'm still not going to TRY this recipe, but I'll definitely keep reading your blog! Whew, I almost lost you there. Glad you're sticking around. We throw 'em in our smoothies, makes them super creamy and delicious. One of my favorite desserts ever! This is a household favorite in my family. I make it with lime juice, though, and I make a homemade graham cracker/pecan crust. I also serve with vanilla ice cream. YUUUMM. I want one now! Wow um errr... I think I'll have to try it.. there was once a time when I was completely weirded out by pumpkin pie and now I love it. You American's and your veg as desserts!! Oooooh, this looks interesting. Will definately give it a go. I adore all things avocado. One of my fave ways to eat one is cut in half with a drizzle of good olive oil and a sprinkling of sea salt. Leave it in the skin and eat with a spoon. Simple, but oh so good. :( It sounds sooooo good! Avocados are one of my most favourite foods.. but the sad face? In the last year we've discovered I have developed a severe allergy to them... makes me so sad... but seriously.. that pie sounds AWESOME. This looks sooooooooo good. Can't wait to try it!!! Looks very easy... thanks for the great recipe tip! Yum! What a great looking recipe for St. Patrick's Day. Looks like it is absolutely delectable! you may also like avocado bubble tea! I think I would! I love taro, but haven't tried avocado yet. Absolutely Marvelous !!!!! I am sharing this recipe with both of my sisters, my daughter and my mom. We all LOVE Avocado's, even my 1&1/2 year old grand daughter loves avocados. I like trying new recipes and sharing the good ones with family, it's a nice tradition. Whiz all together in a mixer and enjoy!! No way! And I was thinking avocados were just for guacamole! Need to try these ideas. Magoshi, I love taro milk tea! Anonymous, I guess since it's mostly avocado and sticky condensed milk, the texture is creamy but solid enough to keep its shape. We do something similar with two packets of lemonade kool aid packs in substitute of the avocados, cool whip mixed in, and some green food coloring and call it Margarita pie. I will be trying this tomorrow. I too love avocado and taro bubble tea. Homemade versions are even better! I have had this in Africa made by an Indian woman but served as pudding rather than pie. It is yummy and so fresh tasting! just made this and i think i'll have a bowl of it for dinner instead of the corned beef/cabbage i cooked!! take a look at Rose Shulman's recipes for avocado smoothies in her column "Recipes for Health" published last week in the Health Section of the N.Y. Times. they, too, feature avocados along with ingredients like pears, ginger, walnuts...they sound yummy! Made it today for my in-laws. Major hit! I actually made 2. One with lemon juice, one with lime. I also used fat free condensed milk. I figured the avocados had enough fat in them. The lime juice pie tasted like a super creamy, tangy, key lime pie. So good! Kristyn, do you think the lemon or the lime pie was better? Made this tonight, and it was good! I was hesitant but hopeful, and it turned out well. Next time I'll try lime juice just to compare. I'm certainly not weirded out by a dessert with avocado, but I'm glad to hear there's a lemon taste in there, too. I'm excited to try this! Excited to try this too! I made the avocado pie yesterday. It was easy to make an tasted just like key lime pie. My daughter is vegan so I am remaking it again this weekend for her. I found a vegan sweetened condensed milk recipe by googling. It is time consuming but I will give it a try and let you know if it works. Thanks for the recipe it was delicious. Avacado daquiris are a favorite of mine in the summer time. Wow! Who would have thought of trying this! Looks yummy! Oooo, the dacquiris sound great! I wanna try it! Just wanted to say that I check your blog on a daily basis, I love it! I tried the avocado pie recipe and it was delicious. Every single skeptic that I made try the pie thought it was really good! How prominent is the Avocado flavor? I made an avocado shake (http://www.livestrong.com/recipes/chocolate-avocado-milkshake-2/) a while ago and I was really surprised that I could not taste the avocado at all. Does this essentially taste like lemon or key lime pie? Yes, it tastes mostly like lemon. Made this for Easter, and everyone in the family had seconds! Had to make DIY sweetened condensed milk and a coconut crust b/c of various family allergies, but it was still delicious. And they were all stunned that it was primarily avocado. It's a winner of a recipe, thank you! Flipping through your blog. My parents made this all the time when I was a kid. It was my favorite. Their recipe is the same as yours. Its been years and now I cant really eat dairy. I might just have to cheat one day to have it again. Thanks for the memories. I just made this pie for my boyfriend and I..it was delicious! It was much lighter than I thought it would be and we couldn't taste the avocados at all. I can't wait to try it with limes! Just made this and it is quite yummy. Used a combination of regular and fatfree condensed milk. Made a double batch to fill deep pie plate...A really cool and satisfying adult dessert. Hi!! I just wonder...what if I put some whipped cream in the filling? ?I mean, with the avocado cream, instead of using it just for garnish? ?would it be more creamy or what??thanks! Yeah, seems like it would be fluffier and less dense, right? Tried this today and thought it was quite good. I like that it's so easy to make. Any suggestions on what I can do to cut down the sweetness a bit? I imagine the condensed milk is what firms it up, but I'd like to reduce it by half and maybe replace it with something else if possible. Do you think it would be just as good with lime or key lime juice instead of lemon? Just made this. Soooooooooooooo delicious!!!! I would have never thought it would taste this good! Thank you so much for sharing this! !